This post is about my official first experience being the makeup artist for a wedding last Saturday the 7th July. It was a great experience as i had a time limit of 3 hours to make up 4 beautiful brides, the mother of the bride, the gran and the Bride herself, Rachel. The day started off quite hectic i must say, due to the fact that i wanted to make sure i had everything and didnt forget anything at home! Since we had already done a bridal trail for her and the bridesmaids makeup and for the mother of the bride, we didnt have to rush as i knew exactly what products i was using and for which client. I did my makeup for the wedding before i headed to her place before 11am and i was very pleased with the MUA Matte Foundation for just £2 i am currently using the shade 3 in Gentle Fawn, as the other two colours are a bit to light for my tan at the moment. The wedding makeup for my clients were on the shades of purple, looked very pretty on all of them and it matched their dresses perfectly! A little FOTD for my readers, I went for a pinkish purple toned makeup with a bold Smokey effect with a short winged liner. For products i used a mixture of SLEEK, MAC, MUA & my favorite no17 Mascara. Dress was from NEW LOOK a last minute buy as it was a peplum dress! What colour do you love to wear on your eyelids? 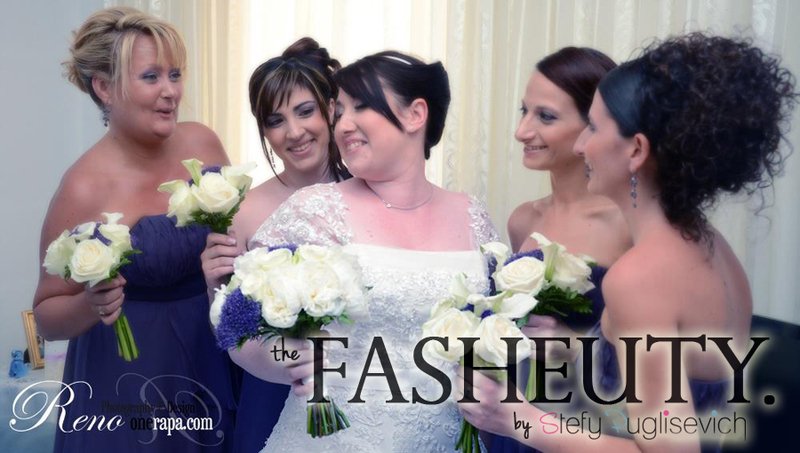 i actually know one of the bridesmaids - i saw some pics & the makeup was amazing!